It has been an awfully long time since I've done any kind of review post—almost two years, in fact—and there is a reason for that. So many blogs these days seem like they're trying to sell you something, and I never wanted you to feel like I was trying to sell you something. I wanted to tell you stories and make you laugh and keep a record of my life that wasn't in a locked diary or on the back of a cocktail napkin, and so a couple of years ago I started turning down stuff to review because I just wasn't particularly interested in it, and I wasn't sure you'd be particularly interested in it either. Then I got pregnant and discovered the wonders of teensy-tiny adorable little baby clothes. Then I discovered I was having a boy and realized how many of those teensy-tiny adorable little baby clothes are actually just for girls. 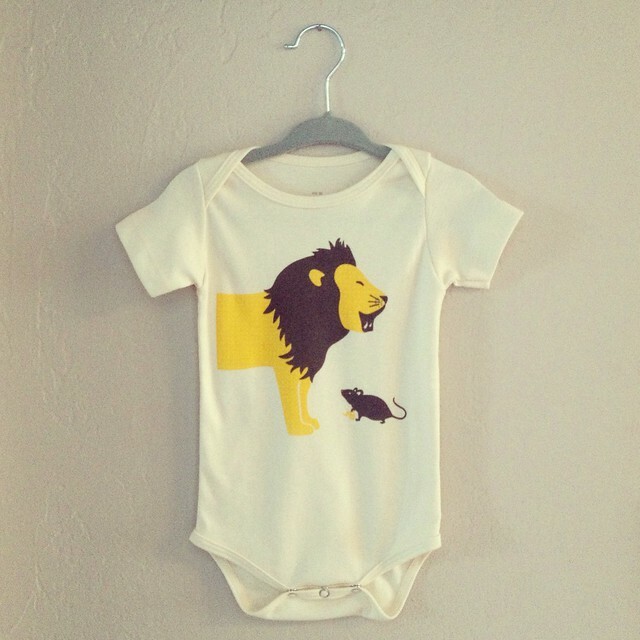 The fact of the matter is this: you have to hunt harder for cute baby boy clothes. A disturbing number of them say things like "Mommy's Little Stud." A vast majority include footballs, flames, or footballs covered in flames. Honestly, I'm not a huge fan of football, and while flames have their place, I guess, I'm not really super keen on that place being my infant son's torso. Leave the flames for the creme brulée torch or the flickering fireplace, that's what I say. And yet man—or baby, as it were—cannot live by plain white onesie alone. Think how boring that would be. Enter Winter Water Factory, a Brooklyn-based company, who wrote to me, congratulated me on my pregnancy, and asked me if they could send me a couple of pieces for the baby. I thanked them and explained that I wasn't really that into doing reviews anymore, and they were like "cool, if you don't like them, you don't have to write about them." But then they sent them to me and it turns out that I did like them and I did want to write about them, so here we are. I mean, just look how cute! Nothing says "yeah, I sleep through the night" like bulldozers and cement mixers. One can hope. A lion! A mouse! A lion and a mouse! Stop it, it's too much. Obviously I haven't tried these pieces on a real life baby yet—I did try and coerce the cat, but ain't nobody got time for that—but I was happy to note that they were both made from super soft, thick cotton (which is apparently 100% organic and made in the USA, two nice little added bonuses.) 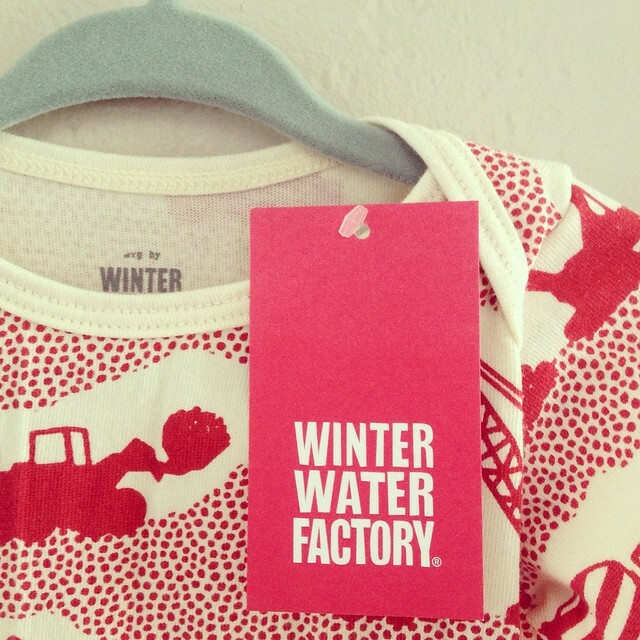 Winter Water Factory doesn't just carry boy clothes—the girls' stuff is, predictably, adorable—but what they do have for boys is really lovely: bold, graphic prints that don't scream I AM A MALE CHILD, AS ADVERTISED BY THIS THING WITH A SKULL AND CROSSBONES ON IT THAT MY MOTHER HAS DRESSED ME IN. In fact, a lot of the stuff is pretty unisex, which seems helpful not only for gift-buying when you don't know what model of baby an expectant friend is having, but also for the hand-me-down potential for a second child. Anyway, when Winter Water Factory sent me the two little piece of clothing above, I asked if they'd consider giving me a coupon code to pass on to you guys, in case you liked what you saw. They very kindly obliged, and now—if you are so interested—you can get 15% off your order with the code BONFIRES15. I've just noticed that they also have a few of these prints in women's sizes—hurrah!—and now I'm trying to decide if it would be gauche to use it myself. The good thing about a baby being a baby is that he'd be too young to be mortified that we match. This is one of my favorite blogs because you are an amazing and interesting writer. Your posts are funny, and I know that you are not shilling for ghost tours unlimited or ahem, Starbucks. I have a little boy, and it IS hard to find cute clothes. Thanks for the review. I know that you are not steering us in the wrong direction because I am currently wearing "shell we dance" on my nails. I had the exact same sentiments (still do) in shopping for our little boy. It is really, really hard to find cute little boys clothes. Even J. Crew is guilty of the cheesy t-shirt craze. Holly, I just wanted to say how much I admire how thoughtfully you approach your blog: it's very gracious of you to explain your reasoning behind not doing product reviews (although I'm sure they would make us laugh, too!) and making an exception in this case. You've been so generous in subjecting yourself to commentary by sharing the details of your pregnancy (I was really struck by how sweetly you responded to the person who asked whether it was safe for you to dye your hair). I hope you enjoy writing this blog as much as I enjoy reading it! When my son was born, a friend of mine in Italy sent over very adorable baby boy clothes--a jacket and overalls set with little squirrels and tiny fancy blue and white outfits among them which stood out in stark contrast to the firemen and football outfits American relatives sent. Also Zutano was a great source of unisex baby clothes. It's funny, I hadn't read your blog in a while when I looked it up a few months back, thinking, "I wonder if Holly is having a baby yet?" and there was your announcement! Congratulations! Things I adore: You/your blog, Winter Water Factory (I discovered them on Instagram a few months ago), being the mother of a boy. Things I find frustrating/difficult: Shopping for clothes for that boy. I am so sick of "Daddy's Little Ditch Digger" and "MVP All-Star Varsity Sports Club" and "The Party's at My Crib, Ladies!" 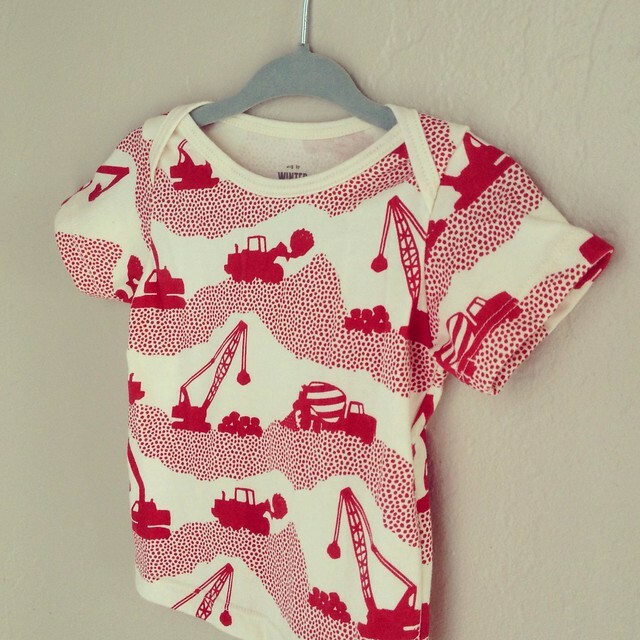 shirts and (in earlier days) onesies all over the boy racks. Not to mention the fact that there are always 30 girl racks and 3 boy racks, so not only is the selection terrible, it's small. Bring on the stripes, solids, plaids, and cute Winter Water Factory-esque prints. I am excited to see how you dress Hamish! And thanks for asking for a coupon code for us! I'm so glad you shared Winter Water Factory. I have an almost 2yo lady baby and it's getting harder to find clothes that I find appropriate. I don't consider myself a prude, but shorts shouldn't be so immodest that the diaper is hanging out. And please, for the love of all things holy, who puts their child in a "Little Bugger" tshirt?! Basically what the above commenter said. Not to sound cheesy, but you have never steered me wrong in your splendid things section, and I really value your opinion on things. So basically when you tell us about a product, I actually believe you because you aren't posting about this stuff every day! I'm SO excited to see how you dress Hamish, that is going to be the most stylish boy ever. You should write more reviews - I'm wearing Shell We Dance at this moment as well! it's funny (and maybe a little nuts-sounding), but I truly did go out and buy several of the things you've mentioned in the past. Namely, the Shell We Dance nailpolish, the tomato Orla Kiely cleaning spray, and that Sonia Kashuk blush. All of which were just as wonderful as you stated! Like the others, I am a huge fan of Shell We Dance nail polish, so we all appreciate you as a curator! I have a little boy as well, now 15 months old. I so agree about boy clothes. My husband and I are not in to sports, trucks, or flames. We get a few of those as gifts, but I get around it by dressing my son like a prep school baby. I buy lots of separates like plain polos and tees (Osh Kosh B'Gosh and Baby Gap are my favorite sources) and then usually khaki shorts or pants. He also has boat shoes. I feel ridiculous because he often looks like he's heading to work at at a Dockers photo shoot. Another great place for baby clothes is Kohl's - that's where I get a lot of shorts/pants. The Koala Baby line available at Babies R US is also good and doesn't have a ton of character/logo shirts. I spend a lot of time planning out my son's seasonal wardrobes. It's a fun hobby! This is great! I'm always on the look-out for kid clothing that doesn't come from a huge box store. I've already spotted a few things to get my girl. Add me to the list of people who have purchased multiple items on your recommendation: the CoverGirl lipgloss in Daring, the tomato-scented Method cleaning spray (and the hand soap), etc. I take your recommendations very seriously!! And this is perfect timing because my best friend is having a boy in July I have been very unimpressed with the boy-baby clothing selection. I'm definitely using the discount code to get her some cute stuff! Thank you. The giraffe and dachsund onesie! GAH! Not to mention that ship tote - an excellent diaper bag alternative. Oh, dear, this will get dangerous. $34 for a onesie? Even with the discount and knowing the cotton is organic, I find this concept preposterous. However I am in the same situation with baby boys' clothes, and this is seriously cute stuff, but prices like this make me twitch. My sister had the same problem looking for baby clothes before she had her baby boy, I tried to help out seeing I live in a major city and she's in the country but wasn't having much luck finding something cute without the price tag...... and then I went overseas to Paris. The choice over there was endless. Those French know what cute is! Pity you couldn't squeeze in another trip to Paris before you're due! I have the exact same complaint about baby boy clothing. Everything seems to imply that my son is either a mini soldier or a mini athlete (both of which, considering my son's parents and his genes, are probably pretty unlikely). And, as other people have already commented, I really don't understand why 75% of any given baby clothing store is little girls' clothes, and only about a quarter of it is for boys. Don't they realize that it is mostly mothers, i.e. women, who are doing the shopping for these baby boys? I understand that many older boys and grown men aren't particularly interested in fashion. If my husband is any indication, my son will hit a point about 10 years from now where he'll refuse to wear anything but sweatpants for five years. But until they are at least pre-teens, mom is doing most of the shopping. All I'm saying is, I'd buy way more clothes for my toddler son if I had more cute options. First--Congratulations! I have thought it many times, but for some reason never actually wrote it. You have hit on something that I get a little ranty about--I apologize in advance. These clothes are adorable, but I have the opposite issue in finding clothes. I have a boy (going on 5 years--he was due July 24th and came July 8th--just saying)and I find that there are tons of cute clothes for him: madras shorts, polos, plain t-shirts, animal shirts and they come in a rainbow of colors and are generally comfortable and practical. I just had a baby girl (going on five months). I find that the clothes for her have ugly ruffles, bows, and decorations, are as stereotypical in their designs as the boys (all hearts and ballet shoes which are well and good but not my thing), are impractical, and mainly come in pink and maybe a very ugly purple. (Oh and head bows--I hate head bows.) Of course, I have found lots of cute clothes for my little girl (largely hand me downs so someone else did the work for me! ), but her closet is very pink and crazy girly (not my favorite things). My son's closet is a rainbow of colors and so much more practical. Even better I don't have to look hard at all for him--in almost every store is something I like for him (lots I don't--I do not understand why we hold up pirates as positive), but often cannot find a single thing I would dress my girl in. However, I seem to be the only person I know who likes the boy clothes better, so it seems I might just be weird. Those are adorable! Great options and I also love that their girl clothing isn't all neon pink and covered in cutesy sayings and bows. I absolutely love this company on so many levels. Claire, now three, has several of their pieces. The quality is amazing and the designs are even better! Congratulations on the upcoming baby! Try looking for baby clothes on zulily - it's like groupon for baby clothes. @Marci, you just described one of my biggest worries about having a girl! I LOVE shopping for my son. Yes, it's more challenging by the result is that I have a wardrobe for him that gives him a distinct style all his own. But when (or if) I have a girl, I'm worried that I'm going to have to dress her like a plastic baby doll and not a real person. So I decided to have all boys. Done. Holly, after you are done shopping at this lovely store, head to the H&M baby section (if you haven't found it already.) It has the BEST clothes for little boys, at great prices.